AUSTIN, Texas – A new Greenpeace USA report documents how the corporate sponsor behind the Dakota Access Pipeline continues to use a variety of surveillance, lobbying, and legal tactics to silence protesters. Project leader Molly Dorozenski with Greenpeace says in the wake of events at Standing Rock, Energy Transfer Partners worked with the pro-corporate American Legislative Exchange Council to introduce 60 new bills across the U.S., many of which classify pipelines as critical infrastructure. Dorozenski says after hiring private firms that deployed military-style tactics against demonstrators at Standing Rock, Energy Transfer Partners has continued to contract firms to infiltrate and surveil activist groups. 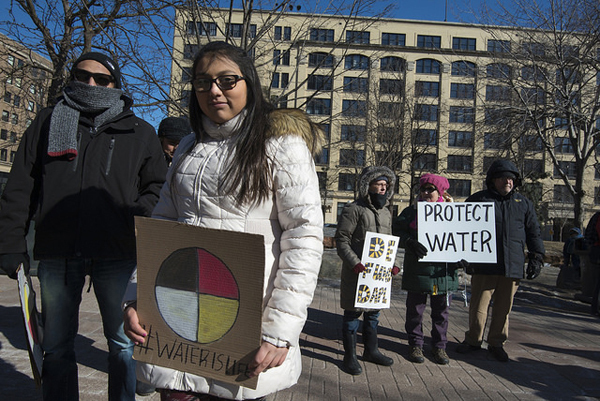 Energy Transfer Partners has not yet responded to a request for comment on the report, but the company has argued that legislation restricting demonstrations near pipelines is necessary to complete its projects and prevent property damage. Dorozenski says the report shows what can happen when corporate power goes unchecked and worries the company’s efforts could have a chilling effect on free speech by labeling peaceful protesters as eco-terrorists. She argues there’s a strong tradition of Americans putting their bodies in the way to disrupt practices that they believe are harmful to communities. Dorozenski adds last year the company filed a $900 million lawsuit against Greenpeace and other groups citing RICO laws, used to prosecute the Mafia in the 1970s, to argue a coalition of environmental and indigenous groups constituted a criminal enterprise. The report’s recommendations include asking banks to cut financial ties with the company behind the controversial Dakota Access Pipeline.